This clinic remodel creates a warmer, more welcoming environment for families with disabled children. The Children’s Clinics occupies the Square & Compass Building on the Tucson Medical Center campus. A variety of clinics are combined into a single location to better serve families of children with multiple disabilities. The clinics are diverse and include internal medicine, orthopedics, dentistry, ophthalmology and physical rehabilitation, as well as other specialties. The existing space did not offer sufficient comfort or activities for families who often spend the entire day inside the building attending various clinics. The client approached this renovation with several goals in mind: improve the reception and lobby areas to provide various activity zones for families with children of different ages, strengthen public way-finding with adult and child-friendly colors and graphics, create distinct identities for each of the clinics and reorganize and streamline functional areas within the individual clinics. 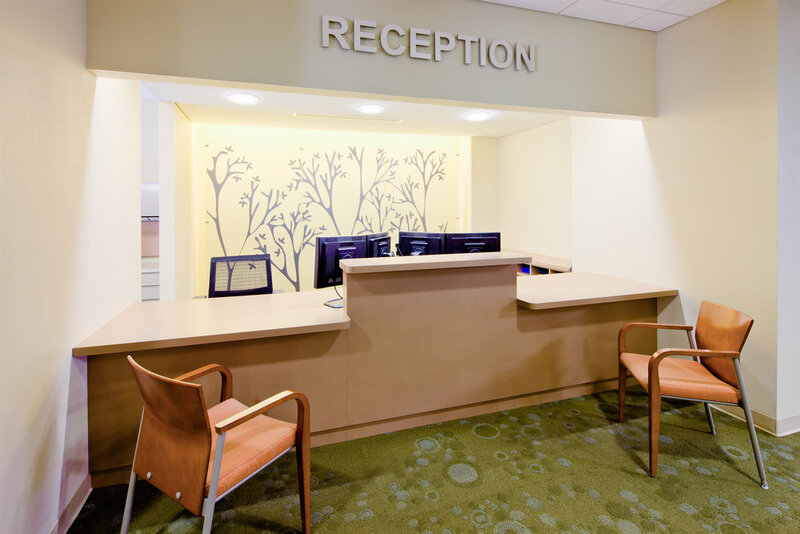 Renovations have provided patients and their families with a more welcoming, comfortable and contemporary environment that better facilitates the overall experience of the patients and their caregivers.